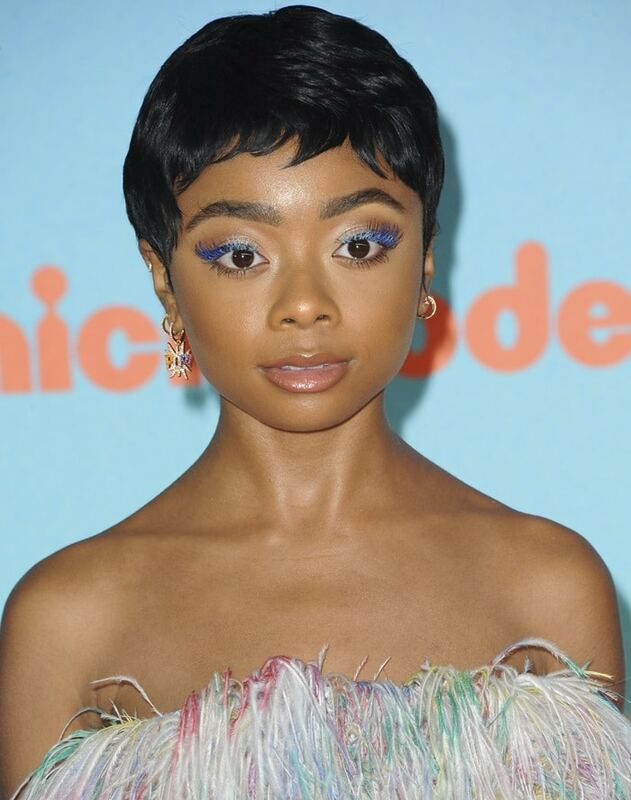 Skai Jackson sported a cute pixie hairstyle and bold blue eye shadow while arriving at the 2019 Nickelodeon Kids’ Choice Awards on Saturday at the Galen Center in Los Angeles. She was joined by 5-year-old fashion diva Taylen Biggs. The 16-year-old Bunk’D actress paraded her legs in a strapless feather embellished cocktail dress from the Rami Kadi Couture Spring 2019 Collection. She accessorized with APM Monaco jewelry and completed her look with metallic leather Stuart Weitzman Nudist ankle-strap sandals.